This holiday season, Jason asked for a SodaStream. I hadn't heard of SodaStream before so he had to tell me about it. It's a gizmo that allows you to make your own club soda and soft drinks at home using tap water, flavored syrup and carbonation. I was very skeptical. All that came to my mind were the Chia Pet, the Sliceomatic and Ginsu knives pushed on those cheesy television infomercials "for only $29.95 plus shipping and processing AAAAAND if you call in the next 5 minutes we'll send you a second set for FREEEEEEE!" You get the gizmo in the mail, it falls apart after one use or it doesn't work or it tastes absolutely horrid. You swear to yourself you'll never fall prey to another gimmicky gizmo ad again. And yet there I was. Against my better judgement, I purchased the SodaStream for Jason. We took it home and assembled it easily and Jason made his first liter bottle of cola in about 5 minutes. He held it out for me to drink. I looked at him like he was nuts and said "You first!" He drank. He didn't spit it out, which I thought was promising. He smiled and said "It's good." He even seemed a little surprised. I tried it and with my lower expectations I was simply amazed by how much I liked the homemade cola. I liked it better than the store bought equivalent (probably because it had less carbonation, which is my preference). Once we'd tried a couple different flavors and had liked every single one of them, I started researching all the flavored syrups they sell, not just the ones sold where we'd bought the gizmo. They offer a lot of flavors online and they were reasonably priced. It was pretty exciting! We drink a ton of pop. Each week we consume 3-4 cases of soda. Jason drinks high-caffeine low-sugar colas. I like fruit and tea based sodas that are diet and caffeine-free and I try to stay away from Aspartame. Most diet soda is sweetened with NutraSweet so there are few options available and those usually aren't available where we grocery shop. 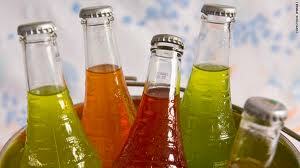 But Sodastream offers diet syrups made with Sucralose (Splenda) and many fruit and tea based syrups. So many yummy options, oh my! In response to the offensive "Not for Women" ad campaign Dr. Pepper Snapple Group launched, I stopped buying my favorite Diet Sunkist along with all the brands owned by them. That took a large segment of the "girl drink" soda market off the table for me oddly enough. Why they'd chose to intentionally alienate a core segment of their customer base (females) and target market for a clear majority of their soft drink brands, I'll never understand. So I was looking for a new favorite soft drink anyway. The timing couldn't have been better! Things started going south when I began looking at the CO2 cylinders. Since we drink so much soda, I assumed we'd upgrade from the smaller 60 liter cylinder to the larger 130 liter cylinder so we'd need refills less often. But I found only one store in Austin that exchanges the 130 liter cylinders. So either I'd have to use 60 liter cylinders, drive out of my way to do exchanges downtown where parking is a challenge on a good day, or order my cylinders online. Online seemed liked a good option, but then I learned that after the filled tanks were delivered to my door, I'd have to drive to my local UPS store (not convenient) to drop off my empties.So 60 liter cylinders seemed like our best option. Then I started looking at the pricing. These itsy bitsy cylinders were expensive! Way more expensive than I'd anticipated. I was thinking about the refills for kegerator CO2 tanks. With the SodaStream, each new 60 liter cylinder was an initial $30 investment. Each refill (exchanging an empty tank for a full cylinder) was $15. Plus there were shipping charges or the inconvenience of going to one of the stores that does tank exchange. The two stores by our house don't offer cylinder exchange. It's not looking so appealing now, neither in terms of cost savings nor convenience. So I start wondering if the cylinders can be locally refilled cheaper than the exchange fee, since I'm going to be driving all over the place anyway. As I research this I learn of User License violations, and booby-trapped double valves. Now I'm starting to feel like I was suckered into a racket where I'm trapped into paying for extremely over-priced CO2. I don't like how this feels. But instead of abandoning the product entirely, I realize I'm probably not the first person to feel the same way so I start doing more research. Instead of refilling that tiny little proprietary 60 liter cylinder, which violates the SodaStream user license, the other option is to replace those cylinders with a larger CO2 tank, like those used with kegerators. So, instead of looking for a way to get around the booby-trapped valve, I start looking for an adapter that will allow me to connect a standard CGA-320 connector to my SodaStream, effectively bypassing the need for that silly little SodaStream tank entirely! There are several places that sell conversion kits online. Some include a C02 gauge. Some include a contaminant filter. Some require the use of the valve from a SodaStream cylinder. They aren't cheap, but frankly I'd rather pay money to someone helping me than a company trying to play games to make more money off of me unnecessarily. There are many types of CO2 tanks that might be used like those for kegerators or paintball or airsoft. The conversion kit must be paired with the replacement tank so some research is required. I purchased a conversion kit and a new 10 lb aluminum CO2 tank since they're lighter and don't rust. I'll get it filled at the same place my home brew-master friends refill their tanks for a reasonable price. I shouldn't have to refill the tank for nearly a year I imagine. It's more cost upfront but I feel better about the whole thing.